This entry was posted in Substance Abuse and tagged Cardiovascular Disease, Misuse, Signs and Symptoms, Stimulant on June 23, 2016 by Team Addiction Hope. While being called big-hearted by friends and family is a flattering compliment, when a doctor say this, you can be sure that serious health consequences are to follow. On top of myriad dangers associated with the abuse of cocaine, users need to know that continued use of the drug can lead to an enlarged heart. Below, we’ll discuss exactly how cocaine use can lead to this life-threatening heart condition, as well as other effects it can have on one’s health. Known in the medical community as cardiac hypertrophy, an enlarged heart is the result of the muscular walls of the heart growing thicker than what is considered healthy. This thickening of the heart muscles can be localized to specific areas. For example, when either of the heart’s atria become enlarged, the condition is known as atrial hypertrophy. And when the ventricles become enlarged, the condition is called ventricular hypertrophy. Now, heart enlargement is not always a bad thing. Regular exercise, for example, causes the heart to grow larger in order to more effectively pump oxygenated blood from the lungs to the rest of the body. This effect is very different from what happens with habitual cocaine users, however. Heart enlargement can become problematic when it causes the body to circulate blood less effectively, which is typically the result of scar tissue buildup within the heart and stiff arterial walls. These harmful kinds of heart enlargement are known as pathological cardiac hypertrophy and are typically caused by chronic high blood pressure, heart disease and heart attacks. Because heart enlargement typically takes years to develop, those who suffer from it often don’t know there is a problem until it is too late. A study published in the Journal of Cardiovascular Pharmacology found that cocaine produces a unique series of events in the body that lead to heart enlargement. The study claimed that when cocaine enters the bloodstream, it activates a protein called CaMK, which triggers an unnatural buildup of calcium in the tissue of the heart. This, in turn, causes the heart to accumulate other proteins that, under normal circumstances, only form in the hearts of developing fetuses. As these proteins develop and divide, the result is cardiac hypertrophy, most commonly located on the heart’s left ventricle. Habitual cocaine use can cause the left ventricle to enlarge by 70 percent, at which point the heart can no longer maintain the necessary timing to circulate blood effectively. Eventually, the heart develops an irregular beating pattern, which can lead to the potentially deadly condition known as cardiac arrhythmia. In severe cases, arrhythmia can lead to cardiac arrest and even death. 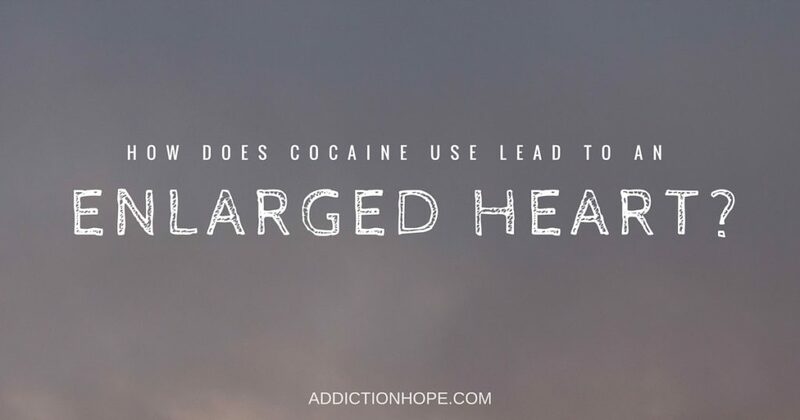 Again, because heart enlargement does not necessarily come with obvious warning signs, cocaine users can be in extreme danger and not even know it. The aforementioned study also found that nearly half of long-term cocaine users have some degree of heart enlargement, so if you or someone you know is a habitual user of cocaine, we recommend you seek help from an experienced cardiologist as soon as possible.